Wajahat Abbas Kazmi, the 32-year-old activist and filmmaker, has been living in Italy for the past 17 years and is the co-founder of the LGBT+ rights organisation Il Grande Colibrì. He started the “Allah Loves Equality” campaign in 2015 to highlight homophobia in Muslim-majority countries and has since been marching proudly holding the rainbow banner with the campaign’s name written across it. “In three years I haven’t had any death threats,” Kazmi told PinkNews. He thought that the display of the Moroccan flag is what fanned homophobic flames. 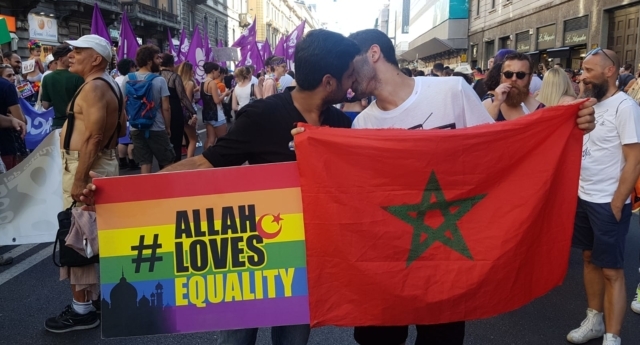 “The majority of people who wrote insults and threats were of Moroccan origins or from the Arab world, [and took issues] especially with the flag rather than the “Allah Loves Equality” campaign,” he said. Kazmi said he received around 40 abusive messages in several languages, including French, Arabic and English, over a several days on social media platforms where he had shared the photo. Most of the messages were sent by anonymous people or people using fake names, which made the process of reporting the abuse harder. “You mess up Islam and my country Morocco […] I wish you death and it will arrive quickly, you will be assaulted because someone known from France has published your photo. Do not mix your unnatural with Islam,” read one of the messages received through Instagram, which Kazmi captured in a screenshot and sent to PinkNews. The sender’s Instagram account is still active. “I am working with our lawyers to report them to the police as soon as our documents are ready,” Kazmi said. “We nonetheless want to report them to say that we are supported, we aren’t alone,” he added. A quick look at the “Allah Loves Equality” Facebook page shows that the subject of Kazmi’s campaigning is far from uncontroversial in Italy too, as despite the many messages of support, some of the posts written in Italian to “review” the page reflect Islamophobic views. But the activist said he was struck by how many of the abusive messages he received about the picture came from second-generation Muslims. “I thought the second-generation Muslims in Europe would be more open and secular, but I have doubts about it—even though I have a lot of Muslim friends who have supported our campaign,” he said. “It’s very sad to see their ignorance on Islamic matters,” Kazmi continued. “These people never studied Islam and they don’t know what Islam says about it. Because of a wrong translation and interpretation they think the Quran condemns homosexuality as a deadly sin, but that isn’t the case. It hurts,” he added. Kazmi believes that Islamophobic and homophobic prejudices can be challenged through dialogue and by being mindful of the different situations of LGBT+ rights reflected across the Muslim world—”Not all countries are as bad as Iran or Saudi Arabia,” he said, highlighting his positive experience in Pakistan. But as more work remains to be done, Kazmi said he and his fellow activists will keep up their campaign. “Next year we’ll bring the flags of all Muslim nations to be the voice of the LGBT+ people who suffer in those countries,” he promised.